Legal Objections to Sell Off – 10 days left! 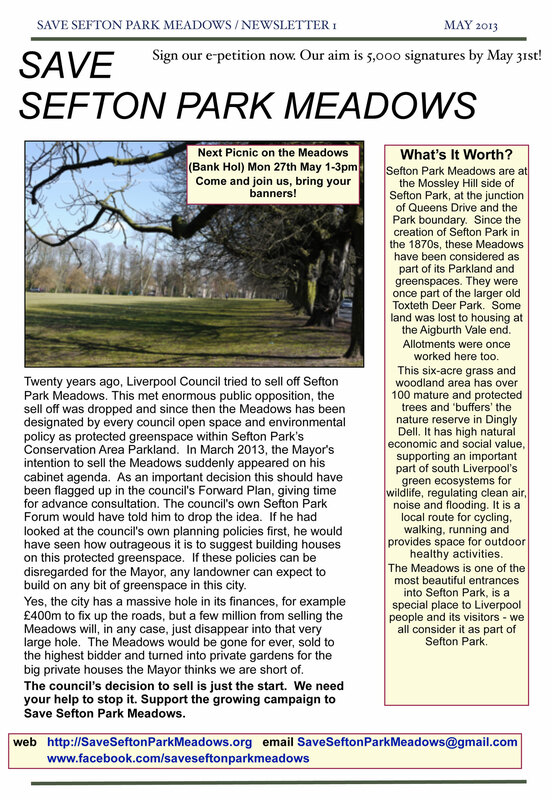 You have 10 days to send in objections to the selling off Sefton Park Meadows by Liverpool City Council. 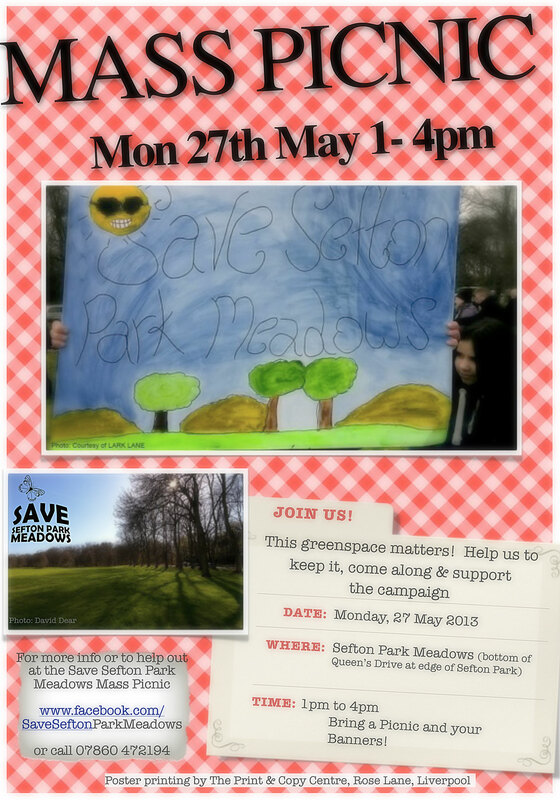 The campaign to stop the sale of our beautiful and valuable Sefton Park Meadows – part of the Sefton Parklands is NOT A DONE DEAL! Postcards are in News from Nowhere bookshop on Bold Street and Oxfam shop on Allerton Road. You can also download and print off a letter and send in yourself. Or use our electronic version of the letter to write in your comments and send direct to the council. Thanks – let’s show Mayor Anderson and his Cabinet they can’t sell off valuable and historic Liverpool public open space around Sefton Park without a fight! Categories: Uncategorized | Tags: climate, conservation, disposal, economic value Meadows, environment, health parks, housing development Liverpool, Liverpool greenspaces, Loss of open space, Loss of Open Space Notice Liverpool, Loss of openspace, objection letters, objections Liverpool, Park Avenue, postcards, Sefton Park, Sefton Park campaign, Sefton Park Meadows, Sefton Park Meadows campaign, Sefton Parklands campaign, sell off Liverpool, wildlife | Permalink. Thanks to all those hardy people who came out in the rain and wind to our second MASS PICNIC on the Meadowlands on Bank Holiday Monday! The really committed even enjoyed their outdoor picnic! We had great fun, despite the weather, and over 600 people joined in over the afternoon for music, food, games, dog training, information and to show their support. Highlights were the Socialist Choir who had even composed their own song, Dan’s sack races for kids and adults, and Phoebe and Catherine’s dog agility and pet grooming area! Dogs and their walkers love this space too… All part of our campaign against Liverpool City Council’s SELL OFF of this historic and valuable public open space around Sefton Park. We’re showing Liverpool City Council that greenspace makes good social and business sense. Mayor Anderson, it’s also a fantastic space for events! Categories: Mass Picnic | Tags: 2013, campaign, city, council, event, grab, green, land, liverpool, mass, may, meadows, off, open, park, parkland, picnic, political, public, save, sefton, sell, space, trees, woodland | Permalink. Our MAY newsletter has been printed and is ready for distribution; to take a closer look, click on the image for each page. NOT EVERYBODY HAS A COMPUTER! Please feel free to download newsletter and print off; this can be done by clicking on each image, and then right clicking the image (“save image as”) to save on your computer, you can then print off in colour, or black and white depending on your printer preference. Images can also be sent as an email attachment. Our petition is going well, but we still need more signatures, both on-line and paper: If you can help with the door to door paper petition, please email us at SAVE SEFTON PARK MEADOWS. You can download and print the paper petition HERE! Also, the councils own on-line E-PETITION. It’s a bit long winded this one, but PLEASE DON’T GIVE UP…..we need every signature to count! 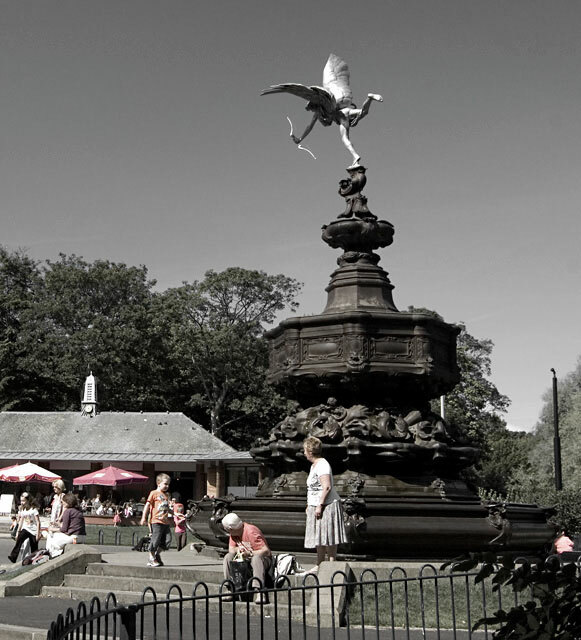 THIS MONDAY…..outside the AVIARY CAFE, in SEFTON PARK, Bank Holiday Monday (6th May 2013) between 1pm and 4pm. SAVE SEFTON PARK MEADOWS: SAY HELLO; Sign the petition, find out more about the campaign, pick up a newsletter, donate to the campaign cause and join in with our FAMILY FUN PAVEMENT ART EVENT; making the park EVEN MORE beautiful this Springtime! 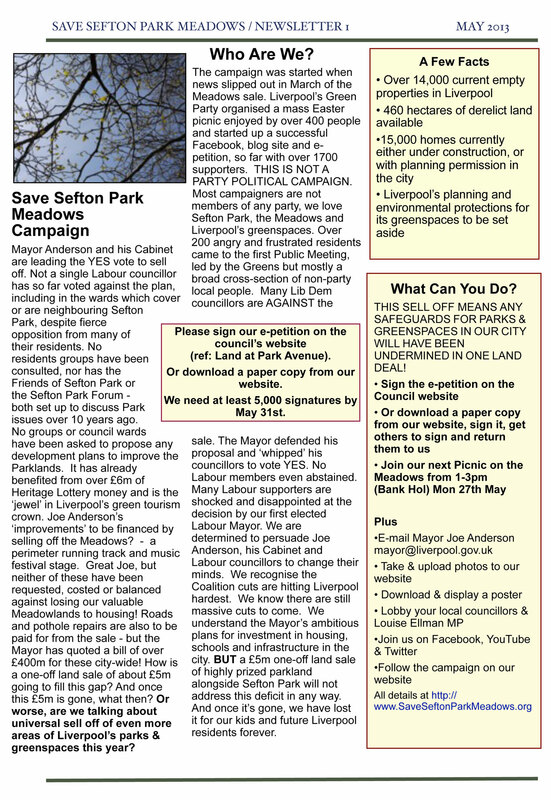 Categories: Newsletter | Tags: 2013, campaign, city, council, grab, green, land, liverpool, may, meadows, newsletter, off, open, park, parkland, political, public, save, sefton, sell, space, trees, woodland | Permalink.